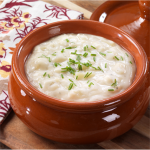 This is a smooth and rich potato soup that goes great with some nice crusty bread and butter. I happen to like a few drops of Tobasco sauce but that's just me.Note: You can change the number of people served by placing your cursor over "Servings". The Ingredients will adjust to the new number of servings. Add broth and potatoes; bring to a boil. Reduce heat; cover and simmer until potatoes are soft, about 20 minutes. Working in batches, transfer to blender or food processor and puree until smooth. Return to pan. Add half and half; gently re-warm but do not boil. Season with salt and white pepper.. Garnish with chopped chives.